Hard-to-treat acne can require "power-level" treatments. A new procedure that treats resistant, hard-to-treat active acne combines light and a special light-activated solution that targets and destroys acne activity. This treatment also diminishes older acne scars leaving your skin smoother. The procedure is called Photo Dynamic Therapy. Acne results from the obstruction and inflammation of the sebaceous glands, and it affects 80% of the human population. Acne typically begins in adolescence with hormonal changes. However, there are many older individuals who suffer from “adult acne.” There are different types of acne; from milder comedonal (blackheads and whiteheads) to moderate, pustular, on to severe cystic acne. In many cases, several or all of these levels of acne can be present on an individual simultaneously. Acne is caused by overactive sebaceous glands in the skin. The sebaceous glands, triggered by the hormone androgen, produce sebum (oil) in the skin. Although androgen is a male hormone, it is present in both men and women. Production of this hormone is highest during puberty, but it is always present in the body. When androgen levels increase, the sebaceous glands release sebum. Ordinarily this oily substance spills onto the skin. When cells from the lining of hair follicles shed too quickly—clumping together and clogging pores—sebum is trapped beneath the skin causing whiteheads and blackheads. Sebum can then mix with the trapped cells and cause Propionibacterium acnes (P. acnes)—bacteria normally found on the skin–to grow in the clogged follicles. P. acnes can cause inflammation and pus and can result in papules or pustules. When the follicles expand as much as they can, bumps called nodules are formed under the skin. Moderate acne may include blackheads and whiteheads in addition to papules —inflamed lesions that appear as small, reddish or pinkish bumps that can be sensitive to touch—or pustules—inflamed, white-centered bumps that can be red at the base. Severe acne is characterized by nodules —large, painful, solid lesions that appear as lumps under the skin—and cysts —deep, inflamed, pus-filled lesions that can be very painful. Nodules and cysts are inflammatory and can cause scarring. Prior to Photodynamic Acne Treatment, the best available treatment option for resistant and cystic acne was Accutane. However, with Accutane there are many systemic* side effects including birth defects, liver abnormalities, mood depression, and virtually all patients get dryness and night vision changes. *Systemic treatments are any medications that are taken orally, injected or infused that affect the entire body system. PDT Acne Treatment provides a viable alternative to all types of acne treatment without having negative systemic effects. The advantages of PDT are rapid treatment of acne lesions all over the face, no scarring, no surgical excisions and no systemic side effects. 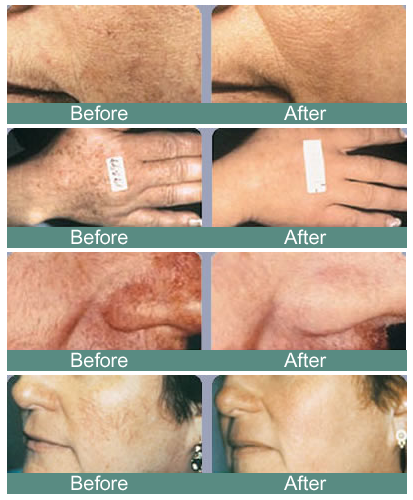 The skin appears refreshed and younger following these treatments. We advise 2-3 treatments at 2 to 3 week intervals to obtain optimal results. The “downside” of Photodynamic treatment (PDT) is that your skin will be red and have some skin peeling (and crusting if you have skin cancers) for several days after the treatment. Usually, the first 1-2 days are the worst. Pressed mineral base powder (available in our office) will hide most of the redness. You must remain indoors the day following your treatment to avoid sun exposure, as you are photosensitive for about 24 hours after PDT. Topical acne lotions can be used in between your Levulan treatments once the redness has settled down over a period of a few days. How much improvement can I expect? Patients with severe sun damaged skin manifested by actinic keratosis, texture, and tone changes including mottled pigmentation and skin laxity may see excellent results. You may also see improvements of large pores and pitted acne scars. Active acne can improve dramatically. How many treatments will it take to see the "best results"
To achieve maximum improvement of pre-cancerous (actinic keratoses) sun damage, skin tone and texture, a series of three treatments 2-4 weeks apart is the most effective. Some patients with only actinic keratoses are happy with just one treatment. More treatments can be done at periodic intervals in the future to maintain the rejuvenated appearance of the skin. When I was 13, I had severe acne. As time went on I’ve tried all sorts of treatments for it. Once the acne was clear I had a sort of rosacea, like redness. I am now 16 and we came across this photoderma. I’ve only done two treatments, but can see a huge difference. Dr. Anderson is a very nice and professional doctor who does a great job at what she does. I would recommend Photo Facial to anyone with severe to slight rosacea. For the past several years my wife and I have had Dr. Anderson as our family physician. We have enjoyed being under her care for all of our typical needs. After developing trust in the great care and services provided by Dr. Anderson and her competent staff, we decided to try some of the special services she offers at Begin with your Skin Medspa . For me, acne and facial scars were a constant problem. Using the Photo Facial services, products and a regiment she and her staff recommends I have enjoyed results that I never would have believed possible. My wife has also been thrilled with the ability to dilute and in many cases completely dissolve spider veins on her thighs and hips. We both have more confidence in ourselves. We have Dr. Anderson to thank! For pricing or any other questions please do not hesitate to call our office at (651) 905-1234 or use the contact us form. Who is a good candidate for PDT? Patients with diffuse actinic keratoses, moderate to severe rosacea, moderate to severe sun damage, textural irregularities, and/or acne are good candidates for PDT with Levulan. Who is not a good candidate for PDT? If you are pregnant, have been on isotretinoin within 3 months, or have an active cold sore you should not have this procedure. If you are taking aspirin or blood thinners, you may experience bruising that can take up to two weeks to resolve. If you are tanned or have recently been exposed to the sun in the area you are having treated, you may be more susceptible to potential side effects such as blisters or crusts and/or your treatment may need to be reduced in intensity or postponed until the tan fades. In addition, patients with pacemakers or internal defibrillators should not have this procedure. Patients with severe sun damaged skin manifested by actinic keratosis, texture, and tone changes including mottled pigmentation and skin laxity may see excellent results. You may also see improvement of large pores and pitted acne scars. Active acne can be dramatically reduced. Achieving maximum improvement is greatly dependent on the protocol you and the doctor select. With a more aggressive protocol just one or two treatments are usually required. If you select a less aggressive protocol it may require two to five treatments. Treatments are spaced two to five weeks apart. Additional treatments may be done at periodic intervals in the future to maintain the rejuvenated appearance of the skin. Patients with diffuse actinic keratoses, moderate to severe rosacea, moderate to severe sun damage, textural irregularities, and/or acne are good candidates for PDT with Levulan.